Apple’s new fifth-generation iPad mini and resurrected iPad Air were announced this morning, and both of the new tablets are equipped with Apple’s latest A12 Bionic processors, initially introduced in the 2018 iPhones. The first Geekbench benchmark of one of the new iPad models (11,2) surfaced shortly after Apple’s announcement, confirming a 2.49GHz clock speed, identical to the iPhone’s clock speed. The benchmarked iPad also features 3GB RAM, 1GB less than the iPad Pro and 1GB more than the 9.7-inch iPad. 3GB RAM is also the amount of RAM in the iPhone XR, while the XS and XS Max feature 4GB. At this point in time, we don’t know if iPad 11,2 is an iPad mini 5 or a 10.5-inch iPad Air, but given the similarity in specs between the two tablets, we suspect that both models are using the same clock speed and RAM. The iPad 11,2 earned a single-core Geekbench score of 4806 and a multi-core score of 11607, which, unsurprisingly, is right on par with iPhone Geekbench results, though a bit faster, perhaps due to improvements in iOS 12.2. 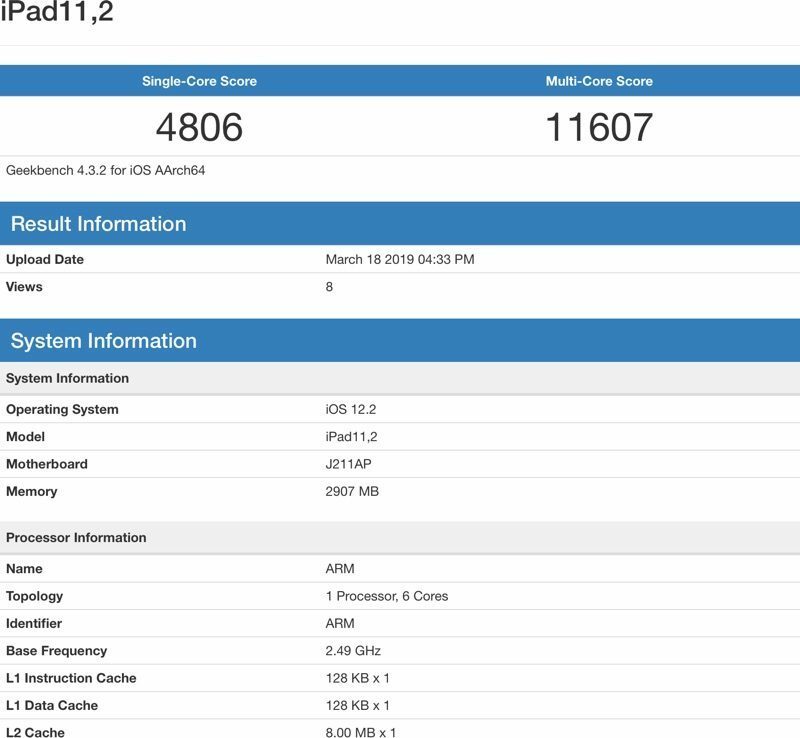 While the iPad Air and the iPad mini 5 appear to feature similar specs and may include the same amount of RAM, we’ll need to wait for further Geekbench scores to confirm. We’ll update this post when more information is available. The new iPad Air and the iPad mini 5 are both available for purchase from Apple today and will arrive to customers at the end of March. The iPad Air, which features a 10.5-inch Retina display, Touch ID, a headphone jack, and Apple Pencil support, is priced starting at $499 for 64GB storage. The fifth-generation iPad mini with a 7.9-inch Retina display, Apple Pencil support, Touch ID, 8-megapixel rear camera, and a headphone jack is priced starting at $399 for 64GB storage.